In this article, we will discuss these items and others to keep you on the road and out of the shops!! Trying to start a new scooter can be frustrating. These are vacuumed engines and require a bit of know-how. They usually do not have a manual choke. Before you even add fuel, you should check the fuel lines and fuel filter to make sure that everything is attached. Sometimes these are left off from the factory and sometimes they just come off in transit. Also, make sure that they are not kinked. After adding fuel, there are two ways to "prime" the carburetor. If your scooter has a manual kickstart, you can try to kick it a few times while alternating pushing the starter button. Simply pushing the starter button only can cause the battery to weaken quick. Also you should never hold the start button for more than 4-5 seconds at a time. The second way is to use a small container with a fuel line attached. Disconnect the fuel line inlet on the carburetor. This line will be coming from either the fuel pump or gas tank. Attach the fuel line with container attached, and pour a small amount of gas into the container. The idea is to get a little fuel straight into the carburetor. Reattach the fuel line to the inlet. Push the start button. If the scooter still fails to start, remeber to check all of the vacuum lines and fuel lines and repeat kickstarting/starter button. Once you've started the scooter, let it run for a couple of minutes. Our next scooter maintenance tip will be to change the engine oil and gear oil. Sometimes China made scooters are shipped with "shipping oil" or just an inferior oil. This should be changed now. The oil dipstick is located on the riht side of the scooter. The drainplug will either be under this, or under the scooter. The drainplug is usually a 15mm or 17mm. Open the drainplug and let the engine oil drain. A typical 150cc scooter will hold approx. 3/4 quart. When the oil has finished draining, replace the drain plug. 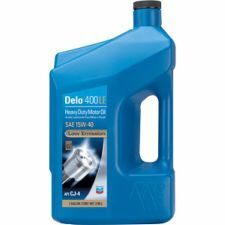 Refill the oil with a good 15W40 weight oil. Use the dipstick to ensure you have the proper level. You may use whatever brand you prefer. For our next Scooter Maintenance tips, let's change the gear oil in the transmission. 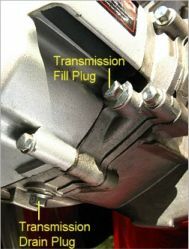 The fill and drain plug for this is located on the left side of the scooter. It is near the rear of the belt cover. (see picture) Simply remove the drain plug and let the gear oil out. Replace the drain plug and remove the fill plug. Fill with a good weight (75W90) gear oil until it comes out of the fill opening. Replace the fill plug. After changing the engine and gear oil, restart the scooter. If you are having trouble starting it, let's try some other Scooter maintenance ideas. Have you checked the spark plug. If not, remove it from the engine and place it back in it's boot. Place the end that would normally be in the engine on the block or frame. It must be grounded. Press the starter button and watch for a spark. Also check the fuel vacuum lines. Make sure everything is connected and there are no kinks. 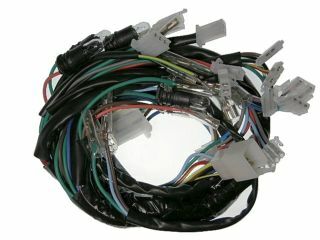 Check the scooter's wiring for loose or broken connections. Also, make sure all of the switchs are in there proper starting position. Other scooter maintenance ideas would be periodic checking of the following areas. Check you tire pressure regularly. 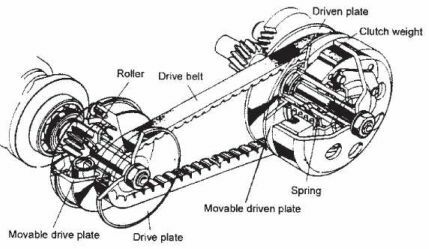 Remove the belt cover and check the drive belt for cracks or tears. Check all of lights and horn. Check the brakes for time to time along with the brake fluid in the master cylinder. And finally, always check the tightness of all nuts and bolts. I can not stress this enough. Certain nuts and bolts will loosen over time. Why? Vibration from high rpm engines and normal road conditions. It is a very good idea to remove key nuts and bolts and use a thread locking fluid on them and re-tighten them. Periodic inspection of nuts and bolts will save many, many trips to the repair shop!